If you have “THE WEDDING BELLS BLUES” let us help turn those blues into songs of joy! Let us help cut those cost down to an earthly number and take the stress out of getting married. Host your wedding at the DragonFly-In for a rational and reasonable rate. The DragonFly-In is a private, gated resort that sits in the heart of the beautiful Arcadia Valley, Missouri. It boasts 2 private lakes on a secluded 176 acre rustic, country estate as the backdrop for that “one of a kind” special event you’ve dreamed of for your wedding day. 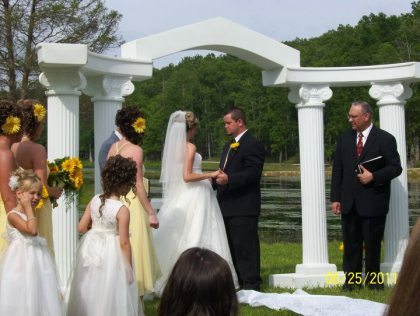 The DragonFly-In Resort has been the preferred location of many Missouri wedding couples. Located only 90 miles from St. Louis, the DragonFly has lots of ambiance to make your wedding day uniquely yours. WE LOVE WEDDINGS! We work with you and can tailor our wedding packages to fit your needs. Just call Linda at 573-546-2994 or 573-631-6401 to customize your special day and discuss our different packages available. We strongly recommend you call to book a wedding tour today. Come see our facility first hand to help you plan that perfect wedding event. Inclimate weather...we've got you covered! The outdoor pavilion has white drop down tent sides complete with cathedral windows and 2 doors, plus outdoor patio heaters are available. The pavilion is located next to Vincent's Lodge, so is only available for weddings at that facility. 4. 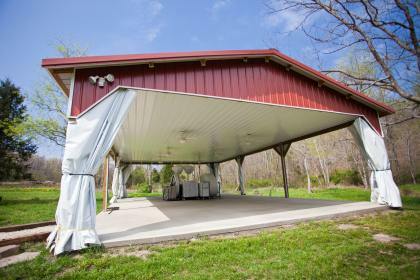 30/50 ft. Wedding/event pavilion; all electric with wedding tent sides that can be utilized for inclement weather, 4 patio heaters with one tank each filled, provided if needed. 7. Ample lighted parking area, 2 outdoor porta pots included. 9. All on site activities, hiking, boats, fishing, swimming allowed in season. 10. Bonfire sites and wood provided. 12. Up to 2 pre-wedding site visits by appointment only, with a 2 hour maximum each for pictures and info gathering. **Damage/ cleanup deposit is $500.00 due at time of event and is fully refundable if no damages are incurred and with required cleanup of event site. 1- 2 pre-wedding site visits for pictures /info gathering/ 2 hour maximum each visit/ wedding site rented only. Planning an elopement or other wedding requirements that do not fit our packages above? Call Linda at 573-546-2994 or 573-631-6401 for special arrangements. Linda can serve as a wedding planner for an additional fee, but we are most happy to help you do your own planning by providing you with a list of area vendors for catering, florals, cakes, carriage rides, hair, and any others that you may require, at no additional charge. click here for printable copy of contract or we will provide a copy for signature. Additional general policies for pets, smoking, etc., for wedding and event cancellations, deposit and refunds the below applies. · A $500.00 nonrefundable deposit is required to reserve your date. · Equal monthly installments of $___________ are required to have the balance due paid in full 2 months prior to the reserved date. · Cancellations made within 6-2 months of reserved date will be refunded at: 1/2 of installments made minus the $500.00 nonrefundable deposit. · No refunds will be given if cancellation made 2 months or later of the reserved date. · For true medical emergencies with proof other refunds can be made after the nonrefundable deposit or a reschedule of event. · A $500.00 damage /cleaning deposit is required in addition. To be given to the Dragonfly-In on the day of your arrival and can be held up to 10 days to determine if any damages have occurred and adequate time must be given for any repairs. If damages exceed the $500.00 deposit to be repaired you will be liable for the full amount of the repair or replacement. · We will inform you of any damages before any action should be taken. Our cleaning crews do check and take pictures of any damages before and after every event. · You and your guest are responsible for all minors in your party. All rules of the resort must be followed for the safety of all our guests. · NO PETS ALLOWED without express consent from management. · An Activity/liability waiver for all your guests attending your event must be signed by the reserving party. There are individual waivers for your overnight guest to sign in addition & are available in all accommodations. I (we) have read , understand, and agree to the contract terms stated above and the cancellation policy put forth for the DRAGONFLY-IN RESORT for all weddings and group events.